Have you heard of the program to help you finance energy efficiency and renewable energy upgrades to commercial, industrial, non-profit, and multi-family buildings called Property Assessed Clean Energy, or PACE? PACE allows you to finance energy-saving measures you make to your building by repaying them as a separate item on your property taxes for a set period of time. PACE helps you eliminate the burden of upfront costs by providing low-cost, long-term financing. PACE allows building owners and companies the opportunity to maintain positive cash flow while investing in energy upgrades at no cost to taxpayers. PACE financing can also make it easier for building owners to transfer financed improvement repayment to the next owner upon sale, as the repayment resides with the property tax assessment. In many PACE-financed projects, the energy savings from the upgrades are more than the semi-annual payments! Energy efficiency upgrades including HVAC systems, lighting, motors, compressed air, and new manufacturing equipment. Other energy efficiency upgrades may also qualify. I’m telling you about this program because it is an excellent way to make improvements to not just our historical downtown buildings, but any commercial property that fits the criteria. Downtown Main Street is dedicated to helping all businesses in Red Wing succeed and we wanted everyone to know about this program. On the back of this sheet is a Case Study that was done highlighting a project at Hobgoblin Music and Stoney End Harps. I think it’ll give you a better idea of what the program might be like for you. To learn more, call Shari Chorney at the Red Wing Port Authority at 651-385-3620. 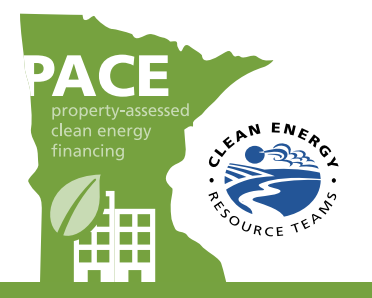 You can also visit the MinnPACE program website https://www.sppa.com/energy-financing/minnpace, or you can go to our website and find additional links: www.downtownredwing.org and click on News. We hope you will take advantage of this program and help us not just conserve energy, but keep our buildings updated!